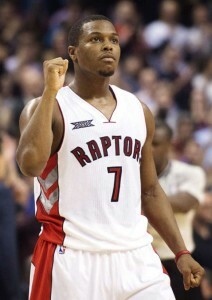 Toronto Raptors All Stat Kyle Lowry was born March 25, 1986 in Las Vegas, Nevada. Drafted by the Memphis Grizzlies in 2006, Lowry signed a two year rookie deal and joined the 2006 summer league Roster. Lowry, was looking forward to a long career in Memphis, however in 2009 he was traded to the Houston Rockets in a three team deal that also included the Orlando Magic. Lowry remained with the Rockets for three and a half seasons with the Rockets going to the post season in 2009. On July 11, 2012, Kyle Lowry was traded to the Toronto Raptors and has become the face of the franchise along with DeMar DeRozan. Lowry’s tenacious playing style has often earned him comparisons to a pit bull or bulldog, with many citing his toughness, leadership and instinct for winning plays on the court. Lowry is considered a strong rebounder for his position, as well as a determined defender. He holds the Toronto Raptors’ franchise record for triple-doubles, as well as the most made three-point field goals in a season, for the 2013–14 season. In Kyle Lowry’s young career he is a two time NBA All-Star (2015, 2016), NBA Eastern Conference Player of the Month (December 2014 and January 2016), NBA Eastern Conference Player of the Week (January 27–February 2, 2014; December 1–7, 2014; February 22–28, 2016 and March 14–20, 2016) and NBA Western Conference Player of the Week (March 14-20, 2011) and George Gross Sportsman of the Year Award. Not only that, Kyle Lowry has been part of the Toronto Raptors past 3 Atlantic Division titles in 2014, 2015 and 2016. Not bad for a player who is in the prime of his career. Let’s hope that he can help lead the Raptors to their first NBA championship in the not too distant future.